Please note: Customized chairs are not returnable. Designed for your active child, the Flash Furniture Contemporary Brown Leather Kids Recliner with Cup Holder and Headrest is a comfortable seating option after a long day of running around. Thanks to its LeatherSoft upholstery, this kids recliner delivers sink-in softness while its solid hardwood frame is exceptionally durable. To ensure your child's safety, this kids recliner will only recline when your child is in a seated position and it is built with raised black plastic feet for stability. 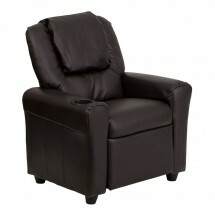 Seat size: 13-1/2" x 15-1/2" x 11"
Arm height from floor: 17"
Back height from seat: 15"
Overall size: 24" x 27" x 21" - 36-1/2"